Epoxytec 45 Primecoat is designed as a rapid drying sealer and primer for elastomeric and epoxy coating applications on concrete. Epoxytec 45 Primecoat is supplied in a convenient one-component formulation. 45 Primecoat is capable of penetrating and filling the porous structure of concrete in order to provide an quick setting, effective surface barrier. Terrific for bond optimization with polyurethanes, epoxies, and other polymer technologies. 45 Primecoat is surface-tolerant for enhanced performance properties for priming and sealing of concrete and other masonry surfaces. Often utilized in conjuction of enhance adhesion to concrete for epoxies and urethane. Coat only clean, dry surfaces. Remove all grease, oil, dirt or other foreign matter by solvent or detergent washing. Previously Painted Surfaces: Remove all rust, rust scale, other corrosion products, loose or heavy chalk and loose or scaling paint by: Hand or Power Tool Cleaning” (SSPC-SP-2 or 3). Brush blast any glossy areas until dull. Spot prime bare areas as recommended and apply one or more coats of Epoxytec 45 Primecoat as specified. Check compatibility by applying coating to a representative area and allow to cure and age. Then make cross-hatched cuts through the coating and check adhesion by firmly applying masking tape to cross-hatched area and removing with a fast pull. If the coating remains intact and there is no wrinkling, lifting, blistering or any other sign of incompatibility present, coating work may then proceed. Epoxytec 45 Primecoat can be applied by brush, roller, or spray. Mixing: Material is supplied in containers as a unit. The unit comes ready as supplied. Thinning: Supplied at spray viscosity, requires no thinning. To obtain maximum edge retention and film build, conventional or airless spray is recommended. Thoroughly flush equipment with solvent. Application by other methods, brush or roll, may require more than one coat. Roller: short nap roller cover. Conventional Spray: DeVilbiss MBC-510 gun or equal; E-tip and 704 air cap; 3/8” ID material hose; double regulated pressure tank with oil and moisture separator. Airless Spray: minimum 28:1 ratio pump; .013” – .017” orifice tip; ¼” ID Teflon material hose; 90-100 PSI line pressure. Shelf Life 12 months, sealed. Storage: Store in a dry area away from direct sunlight. The product should be conditioned to between 40F and 85F before use. Epoxytec 45 Primecoat is a rapid setting, single component epoxy primer and base coat for concrete applications. 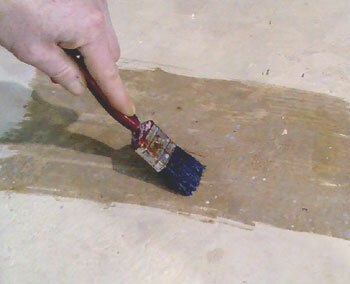 The solvent-based epoxy technology acts as a barrier coat primer. The 45 Primecoat is easy-to-apply by spray, brush, or roller. 45 Primecoat is surface-tolerant for enhanced performance properties for industrial priming and sealing of concrete and other masonry surfaces. Often sought when requiring a fast dry time primer for elastomer and epoxy applications on concrete.